Coin auctioneers on the portal should take advantage of a trend among top numismatic houses Heritage and Stacks Bowers Galleries, which each announced higher buyer’s fees of 17.5%. Combined with new eBay coin rules, which Proxiblog reported in this post, coin auctioneers on the portal should lower Internet buyer’s fees to take advantage of the trend. Several Proxibid houses in the rankings to the right have 15% or lower buyer’s fees. Currently Teletrade has 15% and GreatCollections, capitalizing on the unfortunate trend of Heritage and Stacks–raising buyer’s fees during a recession–boasts 10% fees. Teletrade not only has a 15% buyer’s fee but also has 0% no reserve auctions every Tuesday. 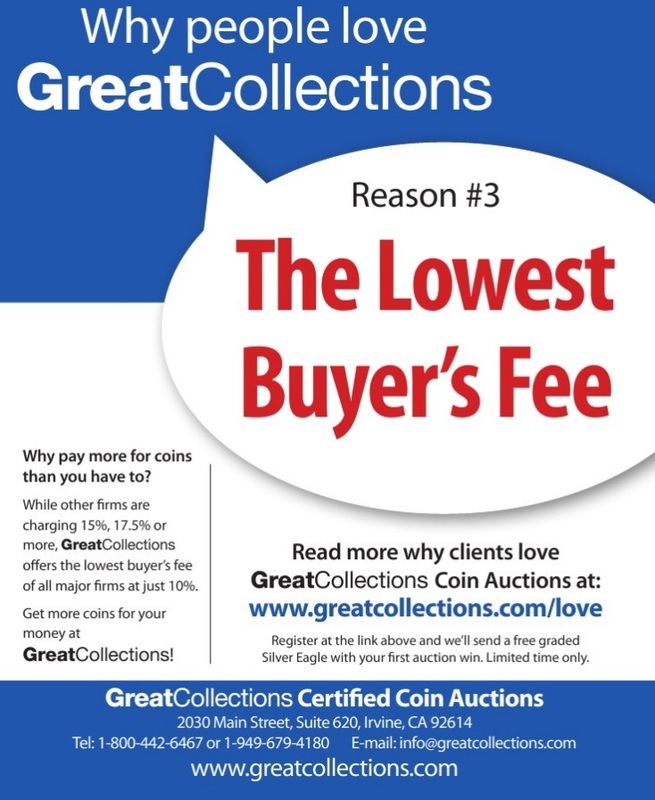 We admire the competitive spirit of Ian Russell, GreatCollections owner, who also auctions raw collections and lots in addition to coins holdered by top companies. See his latest advertisement (click to expand picture). We recommend coin auctioneers on the portal go against the trend of raising online buyer’s fees. It makes no sense for Heritage and Stacks to raise their fees when old gold–$5, $10, $20, etc.–is selling with a small premium over bullion. When consignors get less for their money at houses with high buyer’s fees, because of lack of competition, they will migrate to GreatCollections, Teletrade and, of course, Proxibid. A final note to Proxibid: Take out more advertisements in numismatic publications showcasing auction houses on the portal with low online buyer’s fees. That will begin the migration to Proxibid and yield results in today’s numismatic market! This entry was posted in News and tagged American Numismatic Association, Auctioneers, AuctionZip, Best Practices, Coin Auction, eBay, GreatCollections, Heritage, iCollector, National Auctioneer Association, Proxiblog, Stack's and Bowers Gallery. Bookmark the permalink.